Ken first encountered yoga as a child in the early 1970’s, watching Kareen’s Yoga on television (with Kareen Zabroff on CTV). In his teens, he re-discovered yoga through various books, such as the Bhagavad Gita, the Upanishads, and especially the Yoga Sutras of Patanjali. For most of this time he was chiefly drawn to the spiritual and philosophical aspects of yoga. After dabbling with asana on and off over the years with no real guidance, he gradually slipped away from the practice entirely. As middle age approached he found his body was becoming weaker and less flexible. 40 pounds overweight, and depressed, he was eventually coaxed into reading books by Deepak Chopra and others, which began to rekindle his interest in yoga. After attending a free introductory class on January 1, 2008, the pieces finally came together. He began a consistent asana practice, studying with Theresa Whitely at Oceanside Yoga. Since that time, yoga has become an integral part of his life. He has taken teacher training with Theresa Whitely, and has attended several workshops with other notable teachers such as Donna Farhi, Michael Stone, Diane Bruni, Judith Hansen Lasater and others. He also took YogaWorks teacher training with Catherine Munro, and is registered with Yoga Alliance as E-RYT 200. His personal asana practice is rooted in, but not limited to, Ashtanga Yoga. He maintains a keen interest in both the inner and outer practices of ashtanga yoga, as described in Patanjali’s Yoga Sutras. With the aim of understanding more directly those teachings, he has also become interested in the language of Sanskrit. 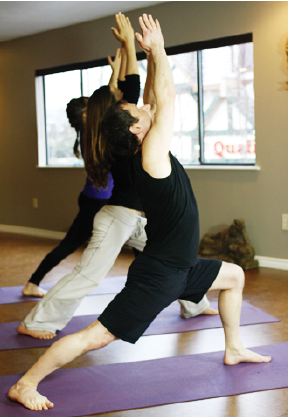 Ken enjoys leading all levels of classes at Oceanside Yoga. He is keenly interested in how the breath and the mind can be made to move together, and how asana practice can be used as a tool for self-discovery, rather than merely a physical “workout”. For Ken’s class times check the Oceanside Yoga schedule!